I am delighted to announce that we have three winners this year from the Kay Snow Writing Contest! These are prestigious awards given by Willamette Writers to honor founder, Kay Snow. Willamette Writers is the largest writers’ organization in Oregon, and one of the largest writers’ organizations in the country. The contest is offered yearly and receives hundreds of entries from across the United States, and as far away as Asia and the United Kingdom. All three girls are talented writers and have been polishing their skills in one on one and team writing at The Tutoring Academy. I have no doubt there will be many more awards in their futures. Eden, Ella, and Chloe join two other award-winning authors from The Tutoring Academy, Lucie Wharton-Moeur, who won 3rd place for her fiction entry, How to Ditch Your Annoying Eight Year Old Neighbor,in 2010, and Jade Cheldelin who won 3rd place for her fiction entry, A Ski Story, in 2008. 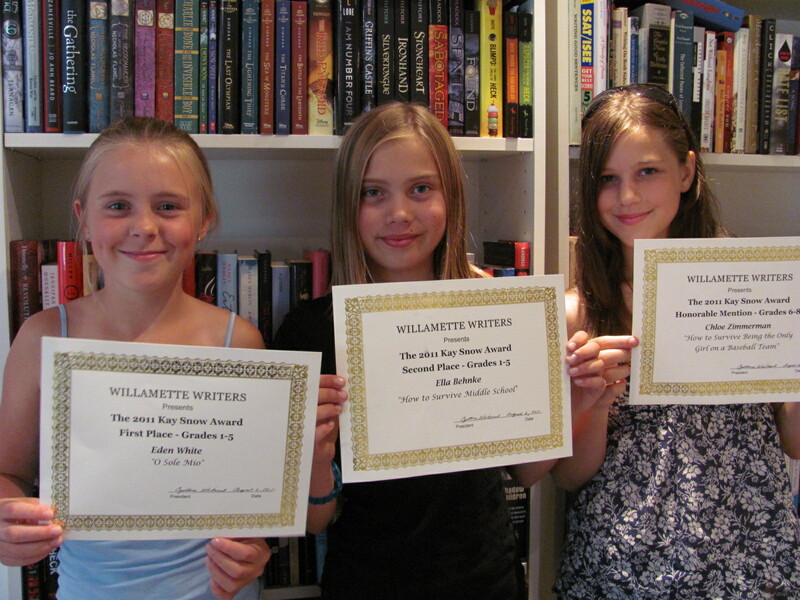 Eden, Ella, and Chloe will be honored at the awards banquet on Saturday, August 6, which is part of the popular Willamette Writers’ yearly writing conference. For more information and to see the full winner’s list, go to www.willamettewriters.com.